If you are a graphic artist or if you need various images to apply for a design project then this post is for you. 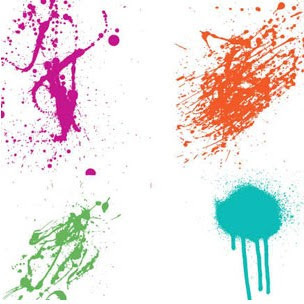 Today, we have collected several sets of vector graphics which are useful when you are going to create a splatter effect to your artworks – the vector splatter. Vectors are preferred now by a lot of graphic designers as they can be scaled and transformed without losing their quality. Splatters in vector formats are great to use in designs wherein you will need to illustrate splashes of paint, blood or any other liquid. These are mostly in messy and grungy designs such as in some clothing, cards, posters, grunge texture and graffiti designs. Because vector graphics brings out top quality images, they are not just suitable in web designs but also in different kinds of print works.